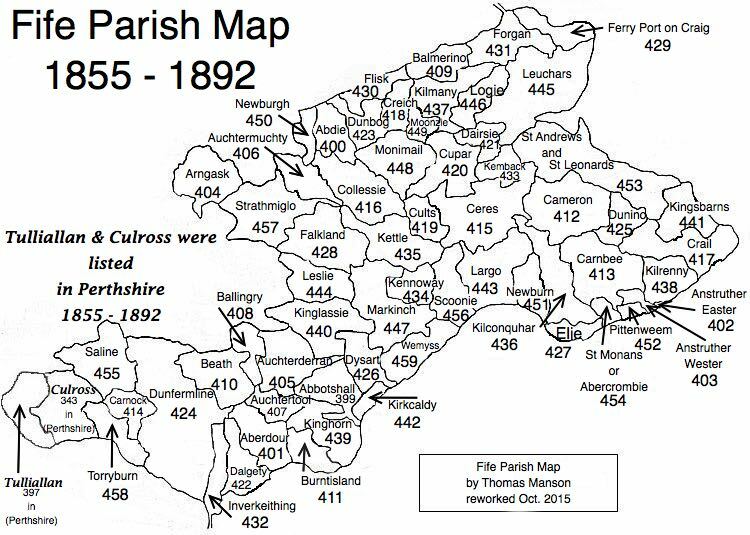 Parish of Ceres – The Fife Post………..for genealogy and historical information. CERES, a parish, in the district of Cupar, county of Fife; containing the villages of Chance-Inn and Craigrothie, 2¼ miles (S. E.) from Cupar. This place, of which the name is of very uncertain derivation, appears to have consisted originally of several distinct baronies, belonging to various families of importance. The church, erected in 1806, near the site of the former, is a neat and substantial edifice, adapted for a congregation of 1100 persons. There are places of worship for members of the Free Church, Associated Antiburghers, and the Relief persuasion. This parish contains five separate villages. The most extensive is Ceres from which the parish takes its name. The second largest is named Cragrothie and the third is Chance Inn. Coaltown was once a thriving village inhabited by colliers. The name Ceres is found in ancient records written Siris, Cyres, Cyrus, Cires and Ceres. The beautiful and useful river Eden runs along the north-west of the parish for the space of a mile and a half. It once abounded with excellent trout, but their numbers are now greatly diminished. Freestone and whinstone abound in the parish and there are several quarries. Coal and limestone are also found in the parish though the coal is not worked. The parish in the past appears to have been made up of a number of distinct baronies. Ceres is a burgh of barony but is not yet chartered. Craigrothie has the privileges of a chartered burgh. There are three fine ruins in the parish. The population of the parish in 1755 was 2540, in 1793 was 2320, in 1831 was 2762, and by 1837 was close to 3000. The increase is due to several manufacturers in the parish, including looms and mills. The town of Cupar is so near to Ceres that the latter has few shopkeepers for venders. There are 8000 acres of land in the parish of which about half is in pasture, slightly less is in tillage, and the rest is woods and moor. There is a great number of cattle fed for the market. Pork is also raised for the London market. Corn and potatoes are grown in abundance. The weekly market is in Cupar. There are two annual markets or fairs held in the village of Ceres. There is an abundant supply of good coal in the area and it is the cheapest fuel. There number of inns may be about 25. Their corrupting influence has not hitherto been very general. A considerable part of the east end of the parish belonged formerly to the parish of St. Andress and about the year 1620 was annexed to Ceres. The present church was built in 1806. It seats 1300. There are also two Dissenter meeting-houses in the village of Ceres, one for the Associate Congregation of Antiburgher Seceders, which was built in 1744, and the other for the Presbytery of Relief. There are about 86 families in the parish attached to the Relief Church and about the same number to the Secession. There is one parochial school, one Secession school, and three contribution schools, besides the schools at Piscottie and Tarvit Mills. There are also two females schools and one or two small private schools. The parochial school-house was built new in 1836 by the heritors and can accommodate 200 scholars. The school-house in Craigrothie was built by subscription in 1806. From 60 to 70 attend there. There are a couple of small libraries in the parish. The above extract was taken from the account written in November 1837.